HMD just announced a beta program for Android 8.0 OS on Nokia phones, and now Samsung is following suit. 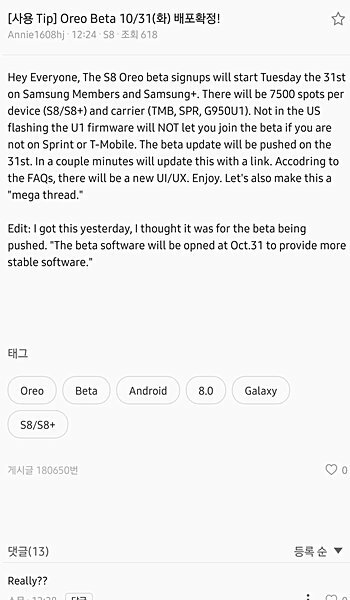 If the information shared in the following screenshot is to be believed, the South Korean company will launch an Oreo beta program for its Galaxy S8 flagships next week on October 31. There will be 7,500 spots for each device, and only T-Mobile and Sprint users will be allowed to fill up these, meaning other carrier models aren't eligible to join the beta program. Sign-ups will be carried away via the Samsung Members and Samsung+ apps. It's worth noting that not only the program will be launched on October 31, the beta build will also be pushed the same day. Aside from the usual Oreo goodies, the build may also bring along a new UI/UX for the devices. As the information isn't coming directly from Samsung, it's not certain just yet, so don't get your hopes too high just yet. The final Oreo is build is expected to roll out early next year. It's cool. Samsung users are enjoying an already more advanced UI and software set than everyone else. Who cares? It would still be more advanced than Android P.